The National Weather Service is warning of a second – ‘significant‘ – round of snow, starting this Friday, Feb. 8. 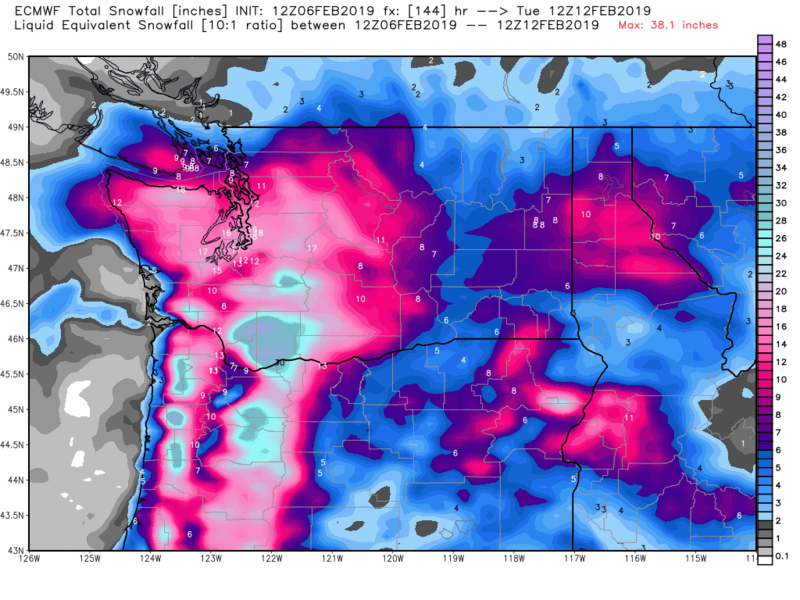 “There is going to be a major snow event over much of the Pacific Northwest starting late Friday and continuing into the weekend. “A much larger snow event than occurred on Sunday night/Monday morning of this week. And one in which snow will be falling on a surface that is now cooled substantially. Today (Wednesday): Sunny, with a high near 37. Wind chill values between 18 and 28. Light and variable wind becoming northwest around 5 mph in the afternoon. Wednesday Night: Mostly clear, with a low around 21. Wind chill values between 11 and 16. East southeast wind around 9 mph. Thursday: Increasing clouds, with a high near 41. Wind chill values between 16 and 26. East southeast wind 5 to 7 mph becoming northwest in the morning. Thursday Night: A 30 percent chance of snow after 10pm. Mostly cloudy, with a low around 27. East northeast wind around 9 mph becoming southeast in the evening. New snow accumulation of less than a half inch possible. Friday: Snow likely before 4pm, then rain and snow likely. Cloudy, with a high near 39. Southeast wind 8 to 10 mph becoming southwest in the morning. Chance of precipitation is 60%. New snow accumulation of less than one inch possible. Friday Night: Rain and snow likely, becoming all snow after 10pm. Cloudy, with a low around 29. Chance of precipitation is 70%. New snow accumulation of 1 to 3 inches possible. Saturday: A 50 percent chance of snow. Cloudy, with a high near 37. New snow accumulation of 1 to 3 inches possible. Saturday Night: A slight chance of snow. Cloudy, with a low around 23. Sunday: A slight chance of snow before 10am, then a slight chance of snow showers after 10am. Mostly cloudy, with a high near 35. Sunday Night: A chance of snow showers, mainly after 4am. Mostly cloudy, with a low around 22. Monday: A chance of snow. Mostly cloudy, with a high near 38. Tuesday: A chance of snow showers. Partly sunny, with a high near 39.